The benefits of breastfeeding are well documented, with WHO recommending exclusive breastfeeding for the first six months and to continue for as long as the child needs. However one of the most common breastfeeding challenges faced by both new and experienced Moms is a low milk supply. 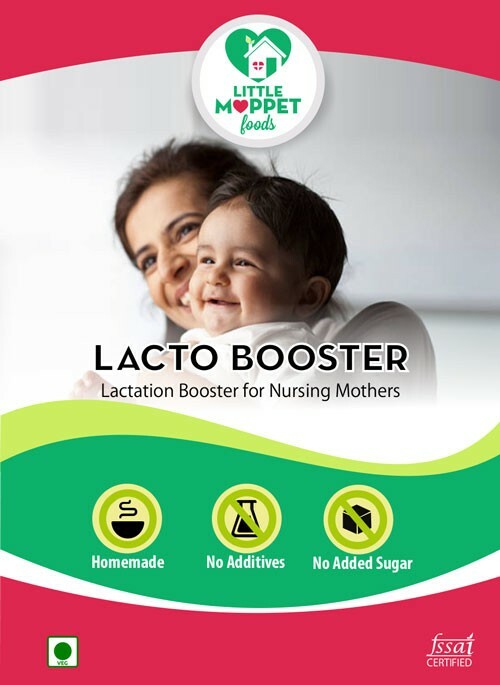 Rather than giving up on breastfeeding altogether, a supply boosting supplement like Little Moppet Foods’ Lacto Booster can help Moms increase their supply to meet their little one's demand. Our Lacto Booster is a mix made with ingredients that are known for their lactation boosting properties. 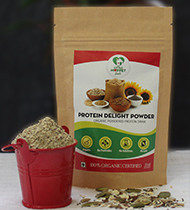 Oats is a rich source of dietary beta-glucan, that increases prolactin, the breastfeeding hormone. Along with oats, whole grains like dalia and brown rice are also high in beta-glucan. The high Calcium content of Sesame seeds helps to boost milk production. Cashews and almonds are rich in healthy fats and Vitamin E, both of which help to maintain a good supply of milk - they also have lots of antioxidants. 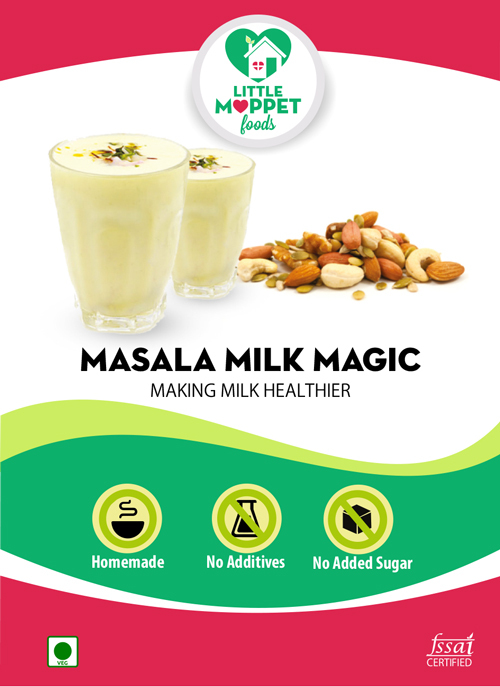 There are many things that Moms can do to to ensure a good supply for milk like drinking lots of water, massaging the breasts and staying relaxed. 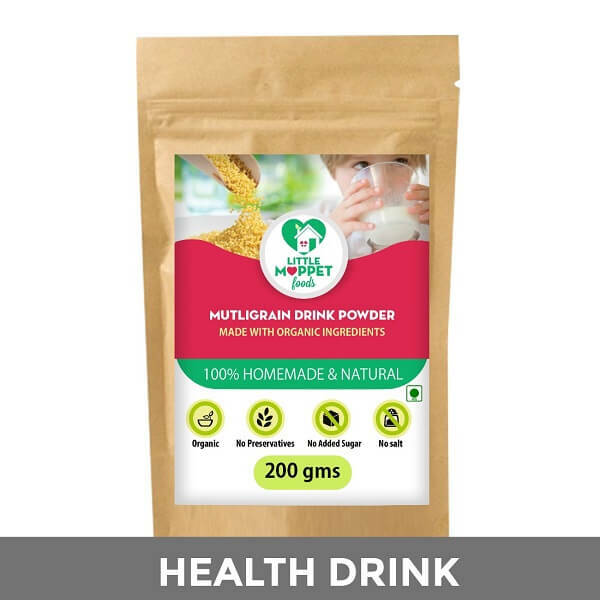 Little Moppet Foods’ Lacto Booster completes this healthy routine, and since it's 100% natural and free from preservatives, it is absolutely safe for Mom and baby. 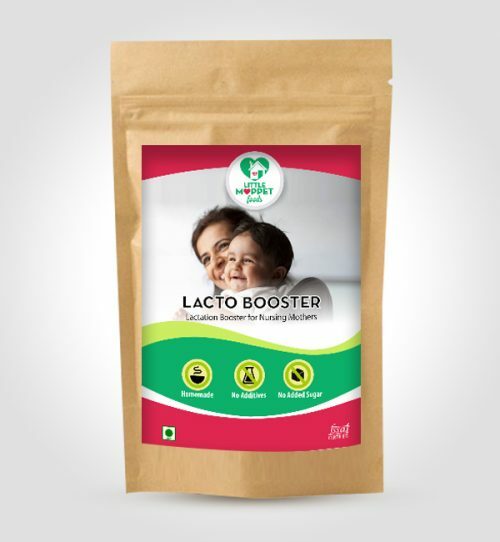 Lacto Booster is available in 200 gm packs. 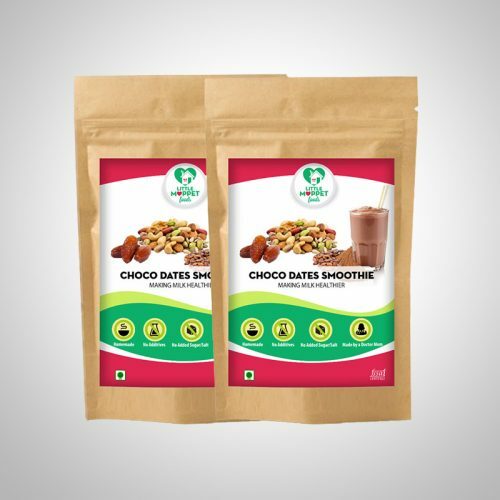 Mix health and taste with a glass of creamy and delicious Choco Dates Smoothie! Here’s a riddle for your kids – what’s tall, brown, good looking and great for your health? 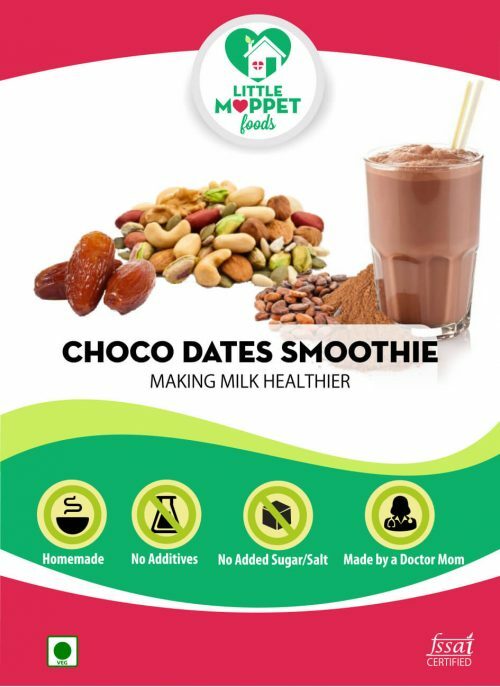 Not sure if they can guess, but you’ll know the answer – Little Moppet Foods’ Choco Dates Smoothie! Yes, we’ve gone and made a tasty thing yummier, by adding chocolate! And we’ve done it without taking away from the original benefits of the ingredients. 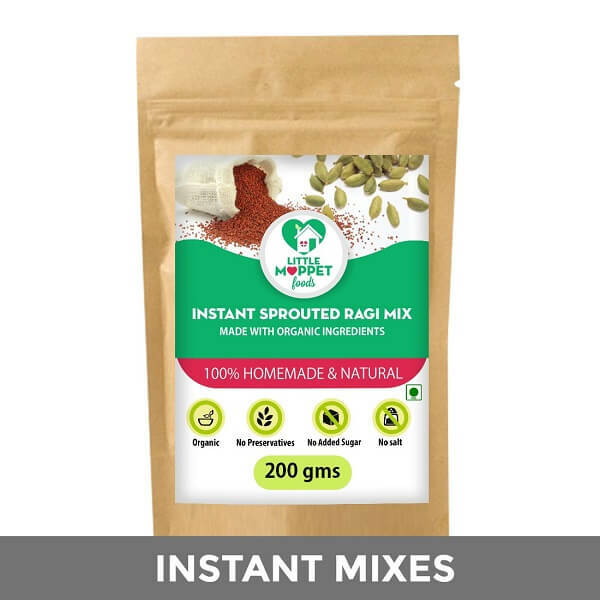 This smoothie mix has dates in the starring role, packed with iron, potassium, copper, calcium and more. 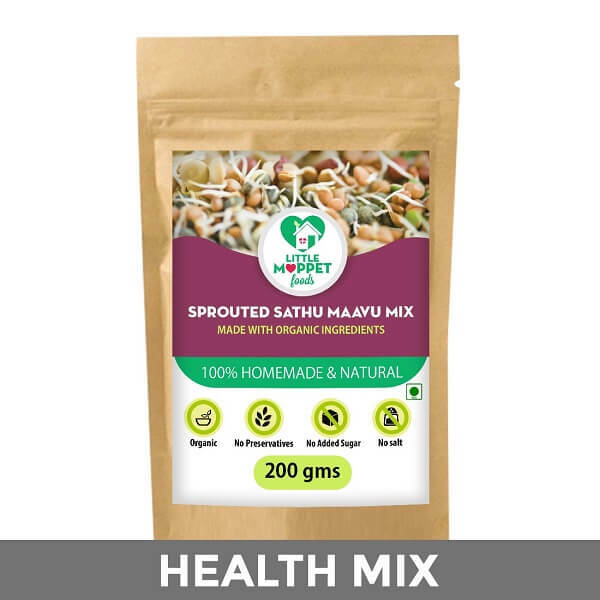 Then there are cashew nuts to encourage healthy bone development, almonds for good brain function and oats for some good ol’ dietary fiber. 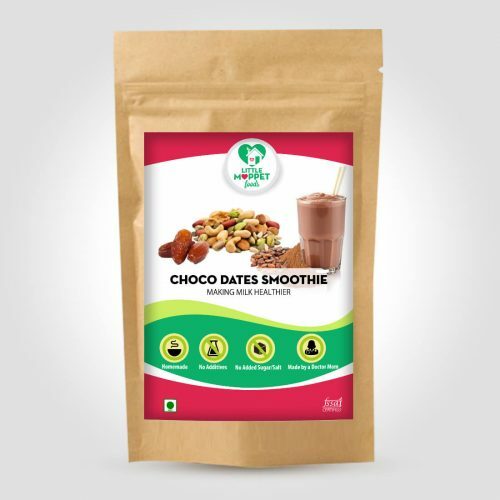 Yes, Little Moppet Foods’ Choco Dates Smoothie is truly a wonder mix! And it’s all the more so because it doesn’t contain any sort of added flavors or preservatives. 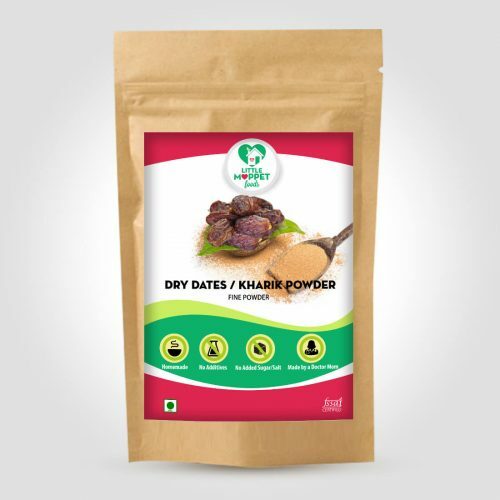 All you can taste is the natural sweetness of dates, the richness of the nuts and of course, the delicious chocolate! 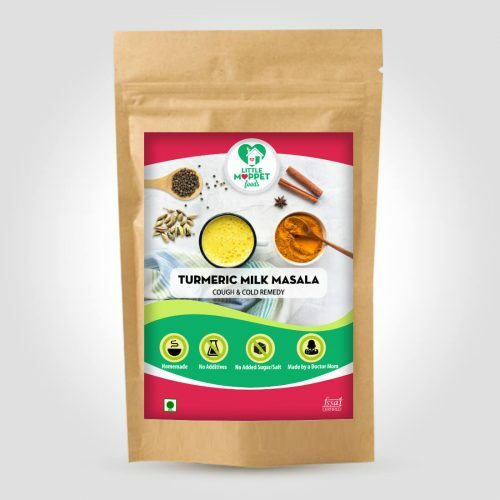 All that glitters is not gold, but this turmeric milk masala certainly is! Gold is beloved in Indian culture, and not just in the form of jewelry or investments! 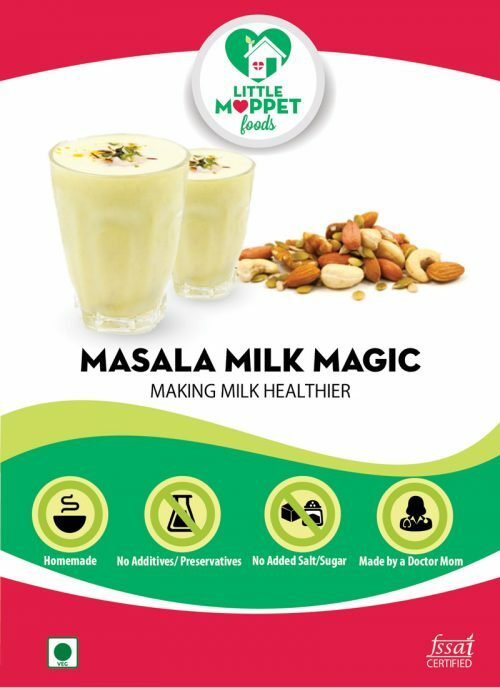 Here’s a new form of gold that’s far more important – Little Moppet Foods’ Turmeric Milk Masala for good health! 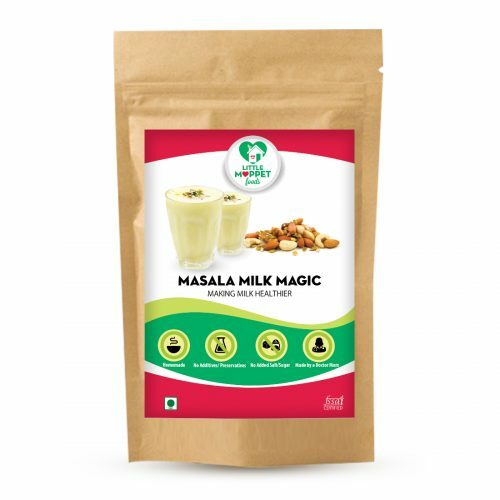 This milk masala mix is ideal for the entire family – even toddlers! It protects kids against asthma, anxiety, digestive troubles, gum disease and allergies while encouraging good sleep at night. It also protects them against illnesses that arise due to seasonal variations, making it perfect for Indian weather! 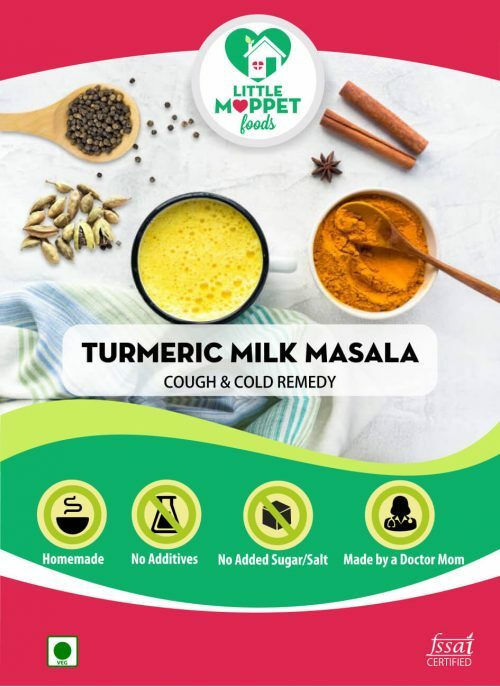 Don’t be afraid at the word ‘spice’ – Little Moppet Foods’ Turmeric Milk Masala is perfectly safe for kids! 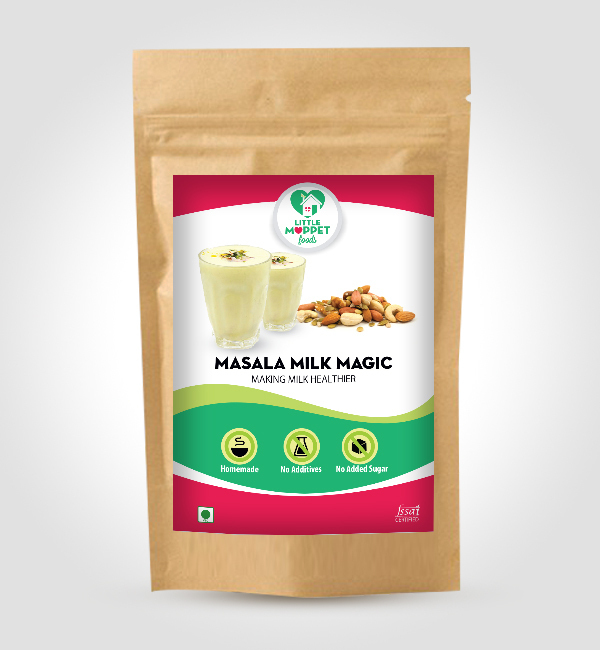 The heat from the spices is very mild and is easily balanced out by milk once it’s mixed in. The result is a nice warm glass of liquid gold, free from any kind of chemical impurities. Strengthen those muscles and lose more weight! What if you could do nothing and lose more weight than before? It’s possible, if you increase your resting metabolism rate – which is the rate at which you burn calories. And to increase that, we need muscles! Building muscle mass is not just for body builders, all of us need it. Especially if we want to stay fit. And for muscles to develop, we need proteins. Protein is an essential component of your daily diet, especially if you’re attempting to lose weight. 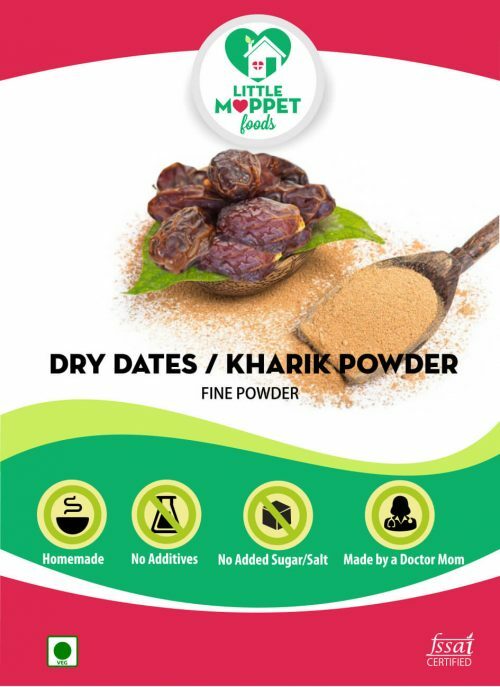 Including a good protein source like Little Moppet Foods’ Protein Delight Powder in your diet keeps you full and reduces cravings for junk food. When you workout and consume protein, your body burns fat and retains muscle, giving you that lean, toned look. 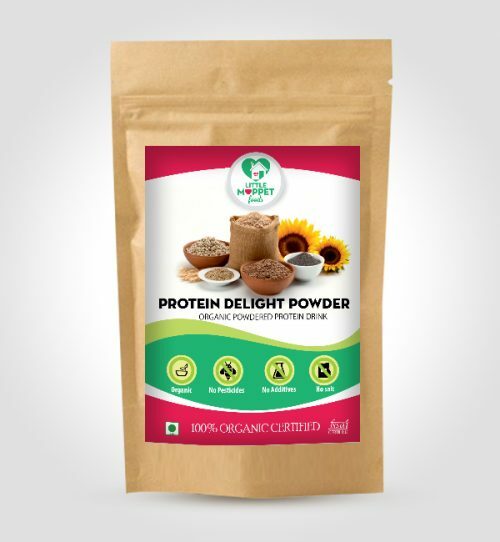 Our Protein Delight Powder takes care of your protein needs and more through its healthy, organic ingredients. Sunflower seeds are extremely rich in Vitamins E & B1 along with trace minerals like copper, manganese, selenium, phosphorous. They help calm the nerves, muscles and blood vessels after a stressful event like childbirth. Oats help in appetite control and also promote relaxation. Pumpkin seeds are very high in zinc and antioxidants. Chia seeds have a surprisingly high protein by weight ratio, and are also full of antioxidants. 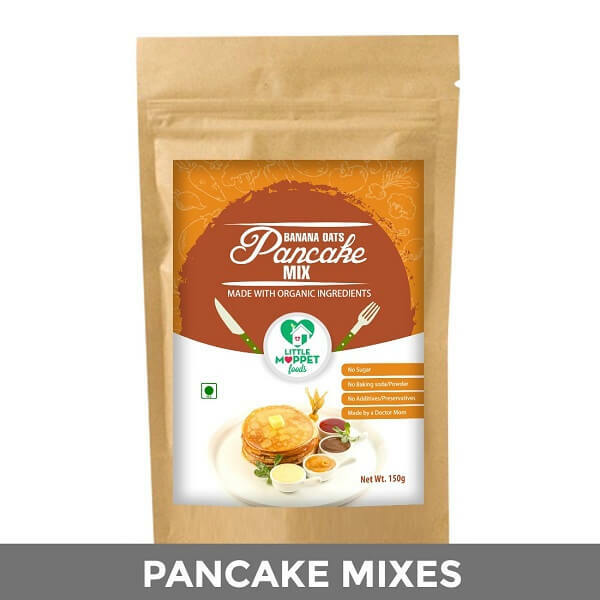 The best part – it’s 100% natural, free from additives and preservatives as well as added flavors or colors. Just stir 2 spoonfuls of the Protein Delight Powder into your glass of warm milk and drink up the goodness! Each is a 100gm pack.